In Vietnam, the price of hospital stay does not include food. Already challenged by the hospital expenses, most patients and their families are hard pressed to buy food. 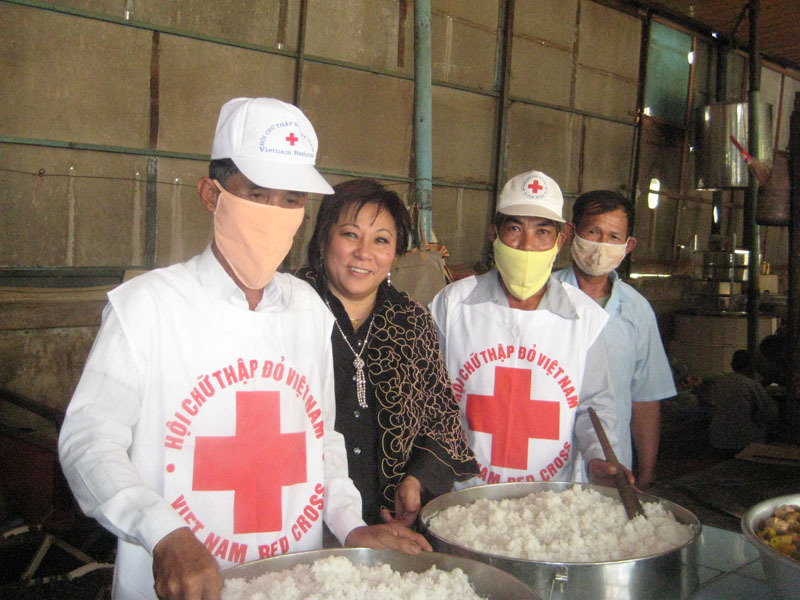 With a grant from BGR, the Tam Binh chapter of the Red Cross of Vietnam, in collaboration with the local government, has stepped forward to feed poor patients in need. The BGR grant suffices to provide two meals a day to patients throughout the year. This is one of BGR’s initial projects, which will now enter its sixth year. Annually renewable project. For the past five years, BGR has been sponsoring scholarships to students in elementary and middle schools in both the Cam Duong and the Tam Binh areas of Vietnam. The scholarships are given by the Red Cross of Vietnam to 150 students in each of the two school districts. These are children from the poorest families who achieve good grades and display good conduct. Without this aid, these students would not have the means to continue studies at the primary and middle school levels. The scholarship provides each student with an enrollment kit that includes the annual enrollment fee, educational materials, and basic health care during the school year. Annually renewable project. This project, renewed for the fourth time, is conducted in partnership with the International Cooperation Center of Thai Nguyen University. The program expands training in the System of Rice Intensification (SRI) to village farmers in three villages of Vo Nhai district, Thai Nguyen province. SRI results in increased yields with smaller inputs of water and fertilizer. Annually renewable project. This entry was posted in Agriculture, Engaged Buddhism, Food security, Projects & programs and tagged CENWOR, Ecology Action, Grow Biointensive, Hospital meals, Malawi, Rwanda, Sri Lanka, sustainable agriculture, Vietnam. Bookmark the permalink.